Ocean front 3 bedroom townhouse right on the beach. Watch the video to see the unit and the beach. Please note that office hours are M-F 9-6 PST. After reserving thru vrbo/HA, extra info will be needed to complete your booking. Email for special deal. I often can offer added days in the OFF SEASON. What do you have to loose? Become a believer: Watch the video. We book weekly for prime summer and winter. Specializing in 30+ day leases for spring and fall. Lets work together to make your Maui dreams come true. This is a beach-front 3 bedroom townhouse condo with air conditioning. It is on the ground floor with no unit above it. It is located in an ocean front GATED community that has 3 pools and a tennis court. 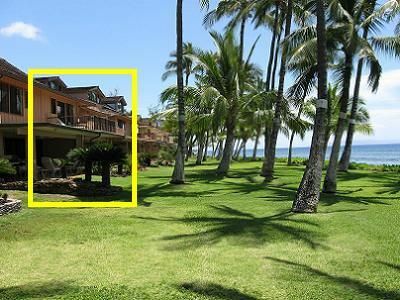 The owner has only this one property in Maui. Yes it is right on the beach. Yes, this is the unit in the yellow box in the picture! When you stay at this town house you can expect the best. * Expect having a beach that is so close and so uncrowded it almost seems like your own. No really! It is 20 paces from the patio. * Expect a big three bedroom townhouse with no one below you or above you. * Expect a wonderfully remodeled unit with no carpet. * Expect a spectacular master bedroom with ocean views and balcony. * Expect a wonderful updated kitchen, and baths. * Expect a gas BBQ on your lanai (patio). * Expect HDTV DVR with full surround sound in the living room and TV's in every bedroom. * Expect a working home office with WIFI internet and a fax/printer. * Expect relaxing on your own patio while watching the kids on the beach. * Expect the piece of mind knowing you are in a private, fenced off 28 acre gated community. * Expect being within walking distance of the fun spot on Maui: Lahaina town. * Expect to be able to park your car right in front of the unit instead of in a parking lot. * Expect not just one swimming pool but three! This includes the fabulous ocean pool that is right on the ocean. Sound good? Research Puamana on the web for yourself. It is a privately held 28-acre gated estate with low-density low-rise buildings: beautiful and safe for kids to explore. Please see the official townhouse web site listed below. Sound better? Now pick one of the most desirable buildings in the complex - 240. It just does not get any better than this. About us: Our family has owned this Maui townhome since 1999. We have 100's of satisfied vacation rental customers. We follow a straight-forward formal quote and booking procedure that is largely all done in email. We also book reservations into our North Tahoe chalet (see # 6358). We employ top notch local property management companies and cleaning services. Our goal is 100% satisfaction. We are an active family that loves board sports of all kinds, skiing, hiking and biking. Why did we buy here? Let me answer that question with some questions of my own: Wanna dip your toes in the ocean? Then walk off the patio about 20 paces and you are in the Pacific Ocean! Wanna surf without having to load the board in the car and drive? Then walk 20 paces out to the beach and turn left or turn right. Wanna enjoy some food and beverages? Then walk or ride a bike into Lahaina town. These are all the reasons we bought here. High rises are not our thing. In fact we prefer the single level town house arrangement to being held captive on a balcony. Being off the beach is OK but we like hearing the ocean. The Big Island is about driving and driving. Oahu is about density. Kauai is a little too quiet. Lanai is dead. Maui is just right. We specialize in 30+ day leases for most times of year. Our unit is a premium unit especially set up for long stays. Stuff like HD TV with DVR recorder for you favorite shows. Its got a small office with a scanner/fax/printer for use with your computer. It has secure WIFI. Lockable guest storage for your luggage and valuables. The place has been renovated top to bottom; every room. It features a wonderful kitchen, large lanai (patio) and a huge balcony. We manage the unit directly. We do a pre-travel phone call to go over things with EACH AND EVERY new customer. Then we check back after your arrival to make sure everything is in order. Because we employ contract services and a local care taker, our rates are usually much better than the competition. Right on the beach! Check out the video. Right on the ocean. See the pix. AC on both floors and in all bedrooms. Fast WIFI from cable company. Seasonings and what is left from other travelers. Kitchen fully stocked with dishes, pots and pans and gadgets. If you think something is missing then pls let me know. Lovely remodeled kitchen with view of ocean. Big dining table with 6 chairs. More chairs available in unit. Table plenty big enough for 8 people. 3 HD TV's in living room and bedrooms. Portable TV for kids room. Lots of books from previous travelers! Usually some beach and pool toys but not guaranteed. Email owner for details. 20 paces of lawn between you and the ocean: nothing between you and the ocean but lawn! Really BIG balcony. Fun place to have breakfast. 2 simple cruiser bikes available. Contact owner for details. Large lanai patio steps from beach. (3) 3 pools including the Sea Pool right on the beach. Your own Gas BBQ on Patio!, cable TV with 3 TV's and a DVR to record your fav. shows, 3 Pools, washer/dryer, private covered parking steps away from front door. No elevator! And the ocean is right there! Whale watch from unit in the winter. Let the kids play on beach while mom and dad watch from the patio, walk/bike into town for fun.